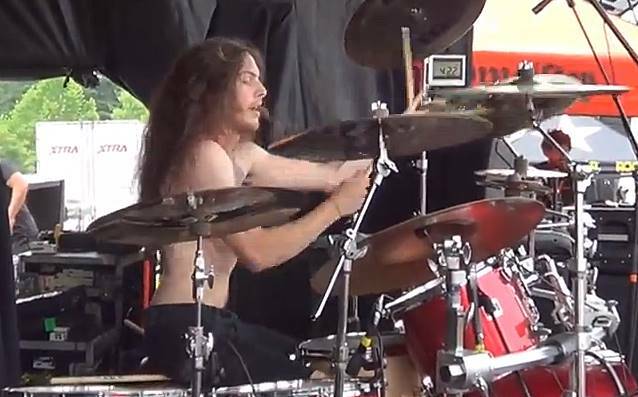 Drummer Jon "The Charn" Rice has announced his departure from Arizona extreme metallers JOB FOR A COWBOY. "As of this past August, I have decided to part ways with JOB FOR A COWBOY," he told MetalSucks in a statement. "There are a few reasons for this, none of which I'm going to get into. "That being said, I have no intentions of stopping touring or playing. I honestly love to tour and play live with new people, so I look forward to playing in new musical arenas in the future. "The dudes and I are on very good terms with this and they understand the decision. They have a new record in the making and I'm extremely excited to hear it. JOB FOR A COWBOY's latest album, "Demonocracy", sold 4,900 copies in the United States in its first week of release to debut at position No. 87 on The Billboard 200 chart. The band's sophomore full-length CD, "Ruination", opened with around 10,600 units back in July 2009 to land at No. 42. Released on April 10, 2012 via Metal Blade Records, "Demonocracy" was produced by Jason Seucof (THE BLACK DAHLIA MURDER, WHITECHAPEL, TRIVIUM) who recorded the band's blistering "Ruination" full-length, at Audiohammer Studios in Sanford, Florida, and features another strikingly detailed concept cover by artist Brent Elliott White.